Westsong Walkway is in the seaside city of Victoria, one of thirteen communities that form the Capital Regional District of British Columbia. 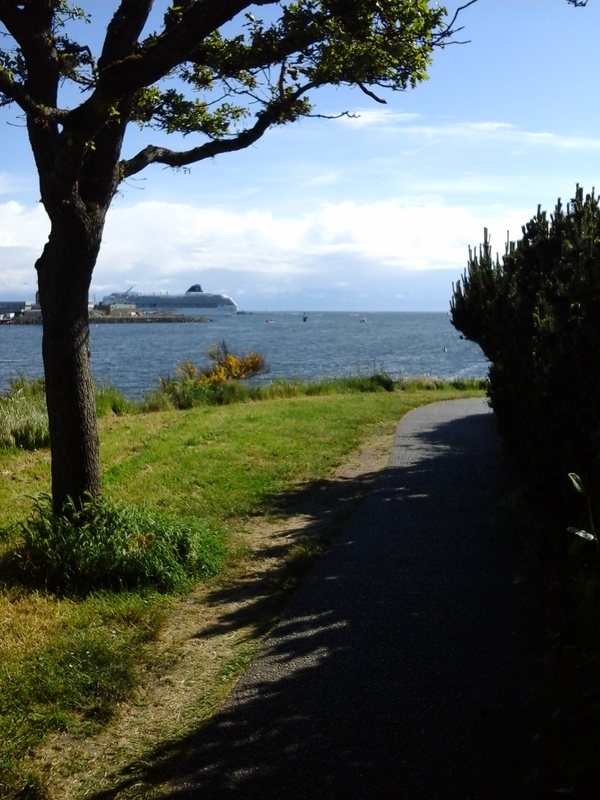 This is a lovely twisting and turn pathway along shoreline that forms the Inner and Middle Harbour of Victoria, B.C. In the Vic West community this pathway is also known as Songhees Walkway, as well as West Bay Walkway. 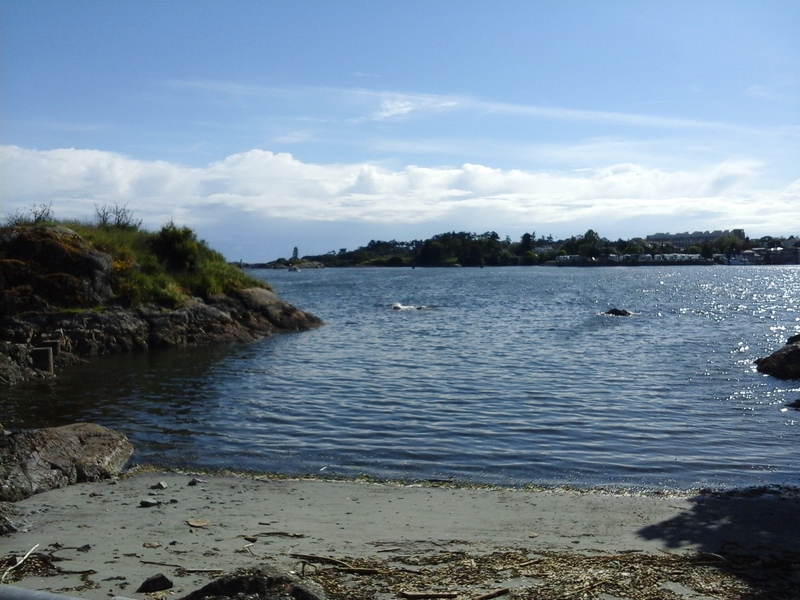 About three kilometer in length, this shoreline hike is from the Songhees Point, near Johnson Street in Victoria West, to West Bay, near Head Street in Esquimalt. The waterfront footpath is across glacial scraped granite rocks and has sections lined with pavement, concrete and boardwalks. It also has multiply access points and numerous benches to take breaks and enjoy the marine activity. There are a few drinking fountains as well as several places to stop for other drinks. It has great views of the Olympic Mountains in Washington State and the busy Victoria Harbour. There are even a few sandy beaches along the way. Give yourself a half hour to take in part of the pathway or when you can spare a couple of hours do the entire distance and back. The eastern end of the trail is most popular due to its easy access from downtown Victoria, BC. Near Johnston Street Bridge and Songhees Point, the Delta Victoria Ocean Point Hotel borders the walkway and maintains many beautiful flower displays. This part of walkway in within the Songhees Point Park. The Victoria Harbour Ferry uses the public wharf for pickups and drop-offs; catch it if you can as it is a fun and adventurous to get on these small vessels. 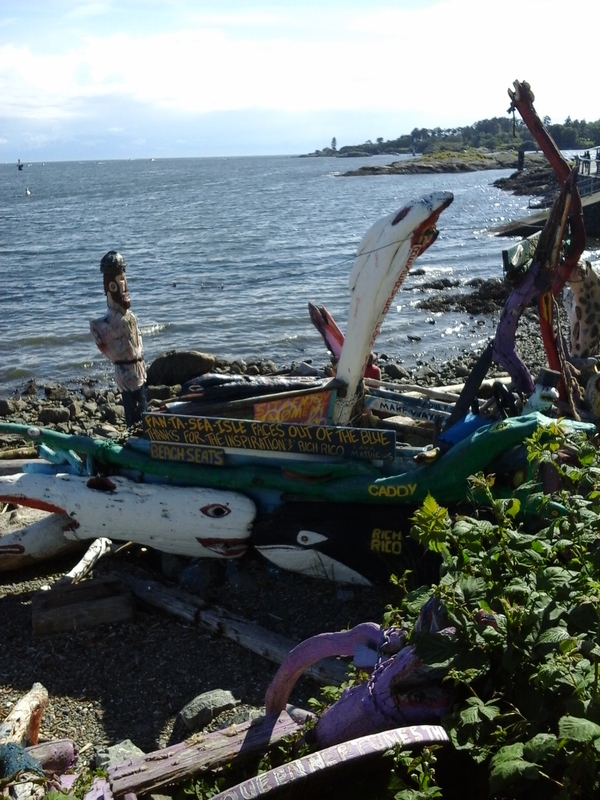 Take in the totem poles and rocky promontory of Songhees Point as well as the small sandy beach. Across the harbour from here is Laurel Point while Tuzo Rock is just off shore to the east. The apartments in this area have alternated their garden hedges, that border the pathway, with rosehips and oregon grape plants. There are two other access points to the walkway that are near 55 and 65 Songhees Road with some pine trees and shrubs along the parking areas. As these is popular starting points there are usually people warming up near these parking areas as well as there is another stop for the Victoria Harbour Ferry. The wide boulevards of Paul Kane Place and Cooperage Place provide terrific view of the harbour and the distant mountains from your car. Between these two streets is a water fountain sculpture, by John Barney Weaver, with dolphins towing a woman. This half curve in the pathway follows around Mud Bay. About a block inland, and across the railway tracks, is Songhees Hilltop Park with some lovely flowering plants and walking trails. As you near the one kilometer point, the Walkway passes into the grassy areas of the rocky Lime Bay Park. As the pathway curves up and round Lime Bay stop in the shade of the horse chestnut trees, near Cooperage Place, or take the shoreline route within the park. A stroll up a slight rise near Kimta Road and Catherine Street brings you to a restaurant pub, Spinnakers Brewpub, that makes a terrific respite from walking. There is parking along Kimta Road or Catherine Street. Continuing southwest, around Lime Bay the walkway enters, through a lovely green tunnel, Mary Street Park, another waterfront park in the Victoria West community. There is limited roadside parking along Mary Street. Mary Street Park has two short pathways that connect into the Westsong Walkway. Between this park and the Rainbow Park are a few benches and another unique outdoor art sculpture. This one lies on the foreshore and likely gets hit by a few waves. As you curve around the point, note the mythical sea dragon painted on the concrete pump station building. Shortly there after the pathway enters Rainbow Park which is named after the first ship of the Canadian Navy and has a couple of places for an excursion, like the picnic table near the boat ramp to the rocky shore. Just off shore is Colvile Island. Once past the small parking area at the end Robert Street, another popular access to the Walkway, are Coffin Point and Coffin Island. There are stairs which are usable at low tide that lead to small sandy beach. Like most of the harbour beaches it’s best at low tides. A few more curves and turns bring you to a board walk near Maitland Street with an excellent sandy beach, best accessed using the stairs during low tide, and a gazebo. Once you’ve reach Barnard Park you’ve gone just over two kilometers. Barnard Park is worth a detour. Take the paved trail that wanders through the forested area just above the Westsong Walkway to enjoy the tall Garry oak, Douglas fir and arbutus trees in this park. Although you will miss the small Barnard Lagoon, a shallow bay that is accessible by a set of stairs that lead under the board walk. There are information signs that describe the sea life in the area. In less than nine hundred meters you’ll reach the end of Westsong Walkway at Captain Jacobson Park in Esquimalt. Westsong Walkway can be reached from the Trans Canada Highway. Continue along the highway as it becomes Douglas Street. Turn west onto Johnson Street and continue across the bridge toward Victoria West as the road curves to become Esquimalt Road. Turn left onto Tyee Road and then left again onto Songhees Road where there is limited roadside parking as well as a couple of parking areas. A city bus travels along Esquimalt Road from downtown.